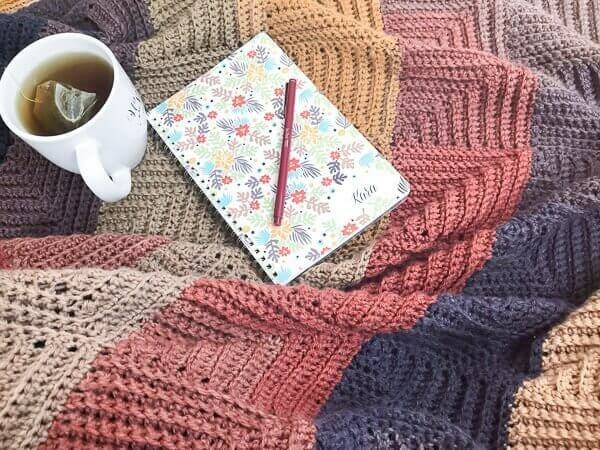 The Continuous Mitered Square Crochet Afghan Pattern has the charm of patchwork squares but is worked continuously so there is no fastening off after each square leaving you with a zillion ends to weave in … yay! And the self striping yarn does all the colorwork for you so you can just sit back and stitch. Each square measures approximately 4.75 in. Finished afghan as written measures approximately 52 in. x 40 in. but can be easily adjusted to any size. 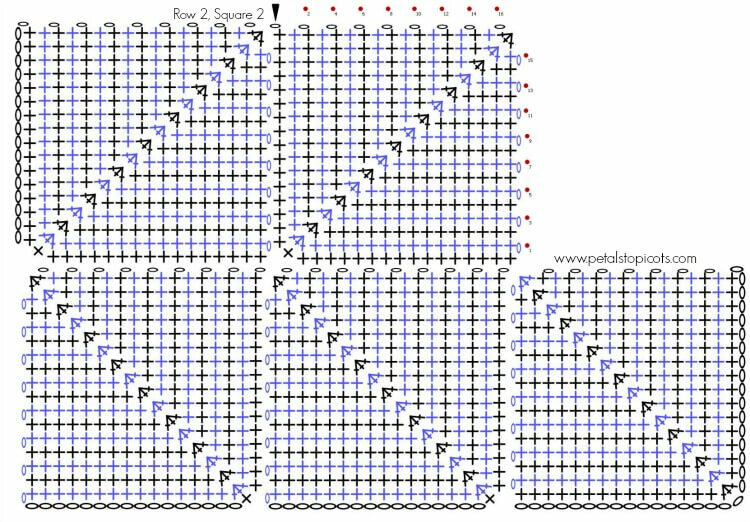 Row 1: Work 1 sc in 2nd ch from hook and each of the next 14 ch, sc3tog, work 1 sc in each of the remaining 15 ch, turn — 31 sts. Row 2: Ch 1 (does not count as st here and throughout), work 1 sc in each of the next 14 sts, sc3tog, 1 sc in each of the last 14 sts, turn — 29 sts. Row 3: Ch 1, work 1 sc in each of the next 13 sts, sc3tog, 1 sc in each of the last 13 sts, turn — 27 sts. Row 4: Ch 1, work 1 sc in each of the next 12 sts, sc3tog, 1 sc in each of the last 12 sts, turn — 25 sts. Row 5: Ch 1, work 1 sc in each of the next 11 sts, sc3tog, 1 sc in each of the last 11 sts, turn — 23 sts. Row 6: Ch 1, work 1 sc in each of the next 10 sts, sc3tog, 1 sc in each of the last 10 sts, turn — 21 sts. Row 7: Ch 1, work 1 sc in each of the next 9 sts, sc3tog, 1 sc in each of the last 9 sts, turn — 19 sts. Row 8: Ch 1, work 1 sc in each of the next 8 sts, sc3tog, 1 sc in each of the last 8 sts, turn — 17 sts. Row 9: Ch 1, work 1 sc in each of the next 7 sts, sc3tog, 1 sc in each of the last 7 sts, turn — 15 sts. Row 10: Ch 1, work 1 sc in each of the next 6 sts, sc3tog, 1 sc in each of the last 6 sts, turn — 13 sts. Row 11: Ch 1, work 1 sc in each of the next 5 sts, sc3tog, 1 sc in each of the last 5 sts, turn — 11 sts. Row 12: Ch 1, work 1 sc in each of the next 4 sts, sc3tog, 1 sc in each of the last 4 sts, turn — 9 sts. Row 13: Ch 1, work 1 sc in each of the next 3 sts, sc3tog, 1 sc in each of the last 3 sts, turn — 7 sts. Row 14: Ch 1, work 1 sc in each of the next 2 sts, sc3tog, 1 sc in each of the last 2 sts, turn — 5 sts. Row 15: Ch 1, work 1 sc in each of the next 1 sts, sc3tog, 1 sc in each of the last 1 sts, turn — 3 sts. Row 16: Ch 1, sc3tog, do not turn — 1 st. Setup Row: Ch 1, working along left edge of previous square, work 17 sc evenly along edge making sure to work last st in very bottom corner, ch 17, turn. Row 1: Work 1 sc in 2nd ch from hook and each of the next 14 ch, sc3tog, work 1 sc in each of the remaining 15 sts, turn — 31 sts. Row 2: Ch 1, work 1 sc in each of the next 14 sts, sc3tog, 1 sc in each of the last 14 sts, turn — 29 sts. Repeat for each square across for a total of 8 squares or until desired width is reached, turn work. Setup Row: Ch 17, work 1 sc in 2nd ch from hook and each of the next 15 ch, work 1 sc in top corner of square below, work 16 sc evenly along top edge of square below making sure to work last st in very corner of square below, turn. Row 1: Ch 1, work 1 sc in each of the next 15 sts, sc3tog, work 1 sc in each of the remaining 15 sts, turn — 31 sts. Setup Row: Ch 1, working along left edge of previous square, work 16 sc evenly along edge, work 1 sc in top corner of sqare below, work 16 sc evenly along top edge of square below making sure to work last st in very corner of square below, turn. Repeat for each square across row. 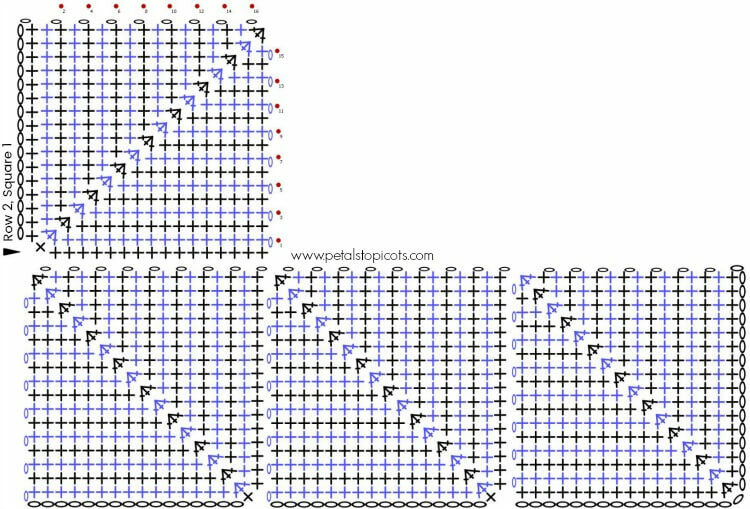 Rows 3 through 11 (or until desired length is reached): Repeat pattern instructions for Row 2. Round 1: Work a Sl st border around entire blanket, working approximately 16 sts across each square edge, join. Round 2: Ch 1, work 1 sc in same st as join and each st around, working 3 sc in each corner st.
Rounds 3 and 4: Repeat Round 2. Fantastic pattern, very easy to follow. wonderful pattern! 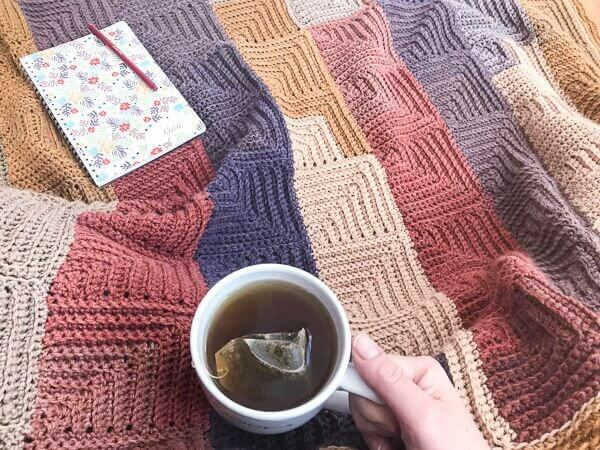 Can you offer some guidance on how to make the squares bigger, and if this would affect the overall dimensions of the blanket. Thank you! 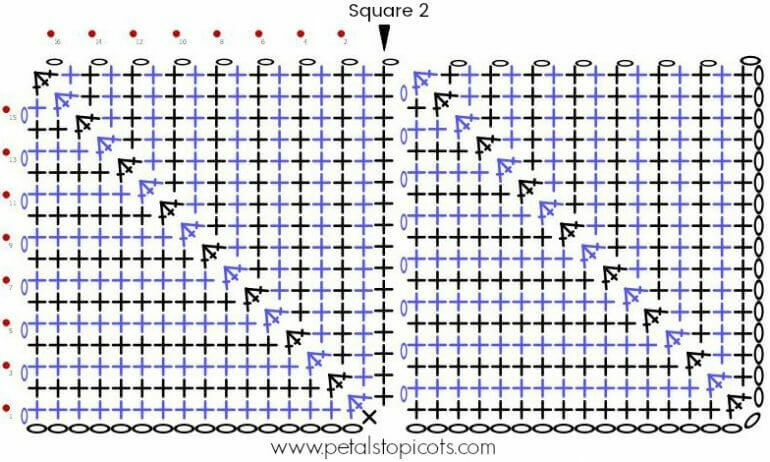 Hi Maureen 🙂 To make the squares larger you would need to increase the beginning chain in increments of two. You would also, then, have an additional row added to each square. And yes, if you were planning to do the same number of squares as I did your overall blanket will be bigger. For those who are avoiding this pattern because of all the counting, there is an easy way to avoid it. After you complete the first row’s 3tog corner of each square, place a stitch marker. The marked loop is the first of the 3 corner stitches on the way back across. And if you put stitch markers on the ch1 at each end, you will not have to count at all after each first row (though I recommend counting once in a while, just to be sure of your work). Is there a full picture to get an idea of when to do colour changes. Is it every 3 and a half squares? Im not very creative so need to follow what others have done to get it to look ok.
Hi Tina 🙂 The beauty of this pattern is that is uses a self changing yarn, like Mandala yarn that I used in mine. Therefore, you don’t have to worry about when the color changes are because the yarn does it itself. If you are using a solid color yarn, I would say to just change colors whenever you feel it would look best. Kara, loving this! You are amazing! I would like to make the squares larger, like a 6 inch or a 10 inch square, do I need to keep my starting chain to an odd or even number? Or will any number of starting chain work? Love love love!!! Just curious: did it just happen to work out that all your edging was in the yellowy color, was it intentional, or is there part of the edging I’m not seeing in the pictures that ended up other colors. Can’t wait to get started!!! Hello Kara! I love your pattern! 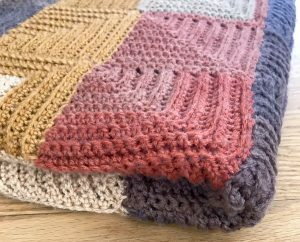 So I started my project,finished first row of squares, I am now at the second square of row 2.I don’t know where to begin….I don’t get the instructions…a little help please! I love this pattern. It’s so beautiful! I REALLY want to make it! I have one question – first I want to say that no matter how many times I rip it out, I wind up with two very different (and messy looking) size squares – then I rip! I don’t know what I’m doing wrong. The question is, In the first instruction, after ch 34, you say “work 1 sc in 2nd ch from hook and each of the next 14 ch…Is it the same to say “15 sc, starting with the 2nd ch from hook.”? I know this sounds like a stupid question, but I’ve only done basic stuff so far and I, somehow, keep messing up my count. Can you help me? Thanks in advance! Hi Laurie 🙂 You are correct, “work 1 sc in 2nd ch from hook and each of the next 14 ch” is the same as saying 15 sc, starting with the 2nd ch from hook.” Hope that helps! I just moved into a new house & I threw my shawl (made of Mandala in Centaur) on the back of my new sofa. It looked gorgeous! So imagine my delight when I saw your stunning afghan! I started working the pattern, but I have a question before I get too far into it. Row 1 measures a little less than 3.5 inches from the first 15 sc to the sc3tog. Am I correct in thinking that it should be 4.5 inches? Thank you for sharing your lovely pattern & for your help! Hi Linda 🙂 Congratulations on your new home! I’m so happy you like the pattern. And yes, you are correct, my squares did measure about 4.5 in. You can have a tighter gauge than I do. The pattern will still work up just as nicely, just with smaller squares. Or you can try to go up a hook size. Hope that helps! I don’t know what I am doing wrong but my counts don’t equal yours. I am trying to do the first block and I did the sc in the first 14 and sc 3 tog, but my last chains equal 16. Going to try it again. Almost finished with my blanket- I must have a tighter stitch or something because I’m on my 4th mandala ball and I still have a much smaller blanket than yours. I don’t know exact dimensions, but I’m making it a baby blanket since it definitely won’t work for an adult. I think my squares are 4 x 4 inches maybe. But just as a heads up to everyone that may also crochet tight. I should have used a bigger hook. Also I now count in my sleep… haha lots of stitch counting in this one. Good luck folks- the texture is worth it though. Loving this pattern so far! This is my first crochet project in years! Do you have any recommendations for changing to a new ball of yarn? Do you leave a tail that you sew/weave back in or do you trim your ends really short? This doesn’t mention knotting the yarn. Do you do a square knot before weaving the ends? Hello 🙂 I do not knot my tails but instead leave a long tail and weave it in as described in your comment. Thanks so much for sharing this beautiful pattern. I have a quick question about the pattern, your notes say that one ball will make 33 squares, is that correct? I just finished my first ball and only have about 12 squares. Yes, that is correct. I just recounted to make sure and 1 ball got me through 33 squares. Are you using Mandala for this? Oh darn, I’ve been using Bernat Pop, I didn’t even realize they had different yardages. But I appreciate you taking time to double check that for me! I have the same question as Chris Eskenazi…. Is there a YouTube tutorial on this technique for those of us who sometimes find a visual tutorial easier than written instructions, especially with a technique that is new to us? If so, that would be great! I love your designs and your patterns are so easy to follow….it’s just this technique that I would love to see demonstrated on video. Thanks! Thanks – yes it does. I found my silly mistake! I’m not sure what I’m doing wrong – I’m starting the second square – row 1. It looks like the second square is left of the first one – I’m not exactly sure where exactly row 1 is. I don’t see where the chains get added. Hi Barb 🙂 you are correct that the second square of row 1 gets added to the left of the first. 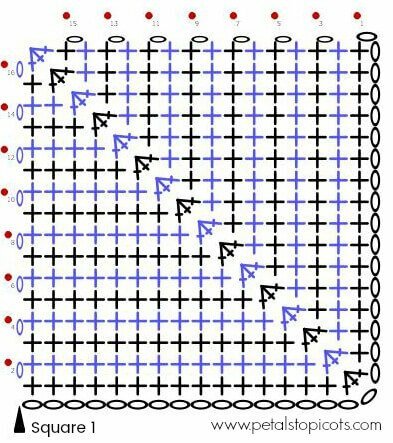 You should be working Row 1 along the edge of the rows from the first square and then when you reach the bottom corner, add on your chains. Hope that helps! have 3 mandalas had to start…thank you for your pattern. This is a fantastic pattern, and your instructions are so clear. It’s unlike anything I have found in the yarn-iverse. I will certainly be trying this when I can get my hands on some of the self striping, Mandala yarn. Thank you for sharing your creation. It’s inspiring for new crocheters, like myself. Great pattern Kara. Thank you for sharing. Can ‘t wait to try this afghan in the Mandala yarn, my new favorite .Recently finished a rectangular granny square afghan with Mandala, it feels and drapes beautifully. I LOVE this design! It seems so simple but I don’t think it would bore me like so many other blankets I’ve tried. Question: Would this work up ok with a heavier weight yarn? I realize it would be larger but is that all? Hi Tina 🙂 Yep, you can work it up in another weight yarn … just be sure to change your hooks size accordingly too. Hi Kate 🙂 I’m not sure if that would work since the stitches would be taller. Thank you this is beautiful. love that it is worked continuously with each square.. Thanks You for this Absolutely Awesome and Gorgeous pattern! Your pattern is so very clear and easy to follow. I love your diagrams! Your blanket turned out just beautiful. Thank You for sharing your creativity with us. Genius design! This is a blanket I would enjoy crocheting! Well done! This is a wonderful pattern. 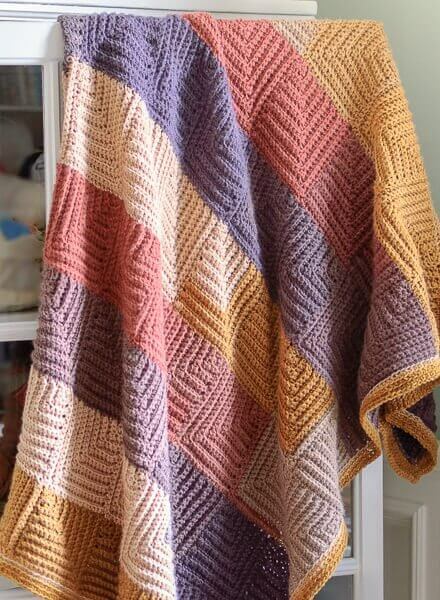 How large is the blanket when using 3 cakes of the Mandala yarn?